SNCF ticket collection is easy, and you can collect your French tickets from SNCF collection machines at stations across France. This guide tells you how. 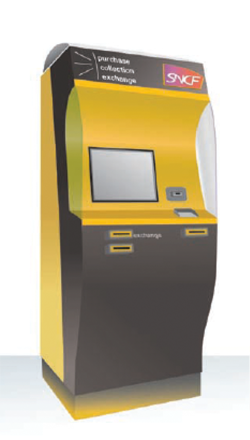 You'll find SNCF self-service machines at 1,400 stations across the French rail network. They feature the SNCF logo and are bright yellow (or white if it's a newer machine). You can collect tickets from any SNCF machine, not just at the departure station. Tickets are usually available to print a few minutes after your online booking is complete. They can be picked up at any time prior to departure. Your payment card is not required for picking up French rail tickets purchased via Loco2. You must validate your tickets prior to boarding the train. See: Validating tickets at the station. 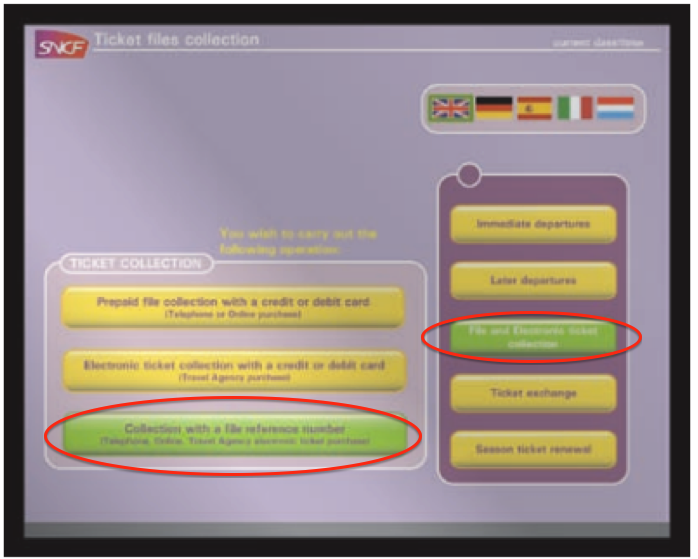 Select “File and Electronic ticket collection’” from the menu on the right-hand side. Then select the third box down on the left-hand side: “Collection with a file reference number.” SNCF tickets booked on Loco2 do not require you to enter the credit or debit card. Your collection reference, sometimes called PNR (Passenger Name Record) or TOD (ticket on departure) reference, is a six-character code which can be found in your booking confirmation email. Please note that it is different from your Loco2 order reference, which is eight characters beginning with “LO-"). Input the surname of the lead passenger exactly as it appears in your confirmation email. If you have any trouble, go to the SNCF ticket desk and present your collection reference (PNR). Your tickets will now print from a slot beneath the screen. Each ticket and its print status will be displayed on screen. Make sure that all of the tickets have printed before leaving the machine. 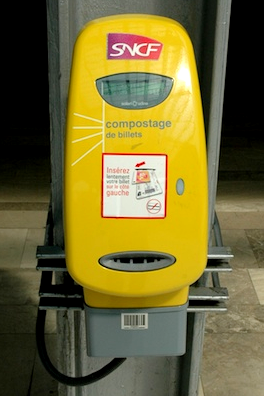 Before boarding, you must validate your ticket at the yellow “compost” or “automat” machines which you'll find either at the entrance to the platform area or on the platform itself. See also: Validating tickets at the station.